The husband seemed to show surprise on his anxious face (fig. 1). The first thing to note here is the nonstandard use of 「亭主」 (read as 「ていしゅ」 in modern Japanese) for 「あるじ」. 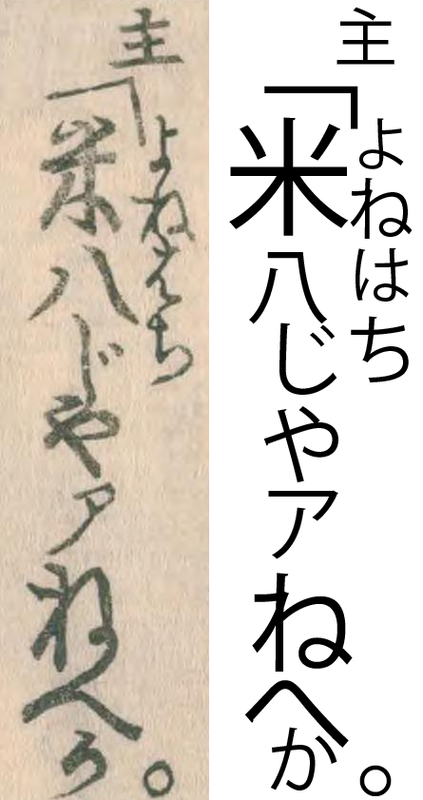 Although it was relatively easy to identify the second kanji, as by itself it is the standard kanji for 「あるじ」 (and because the bottom part of the 「主」 kanji, the 「王」 radical, is frequently seen in the same form as a kuzushiji 「わ」), the first one was more challenging. This is a situation where you really have to take the idea that kanji are about meaning first and pronunciation second to heart. 「亭主」 is another word for "husband" in modern Japanese. I was able to find it with the help (once again), of Nihongo Resources. A quick search for "?主" (making sure to change the "word start" option to "whole word") returned a manageable list of 60 possibilities. Considering the non-standard kanji usage during the Edo period, it makes sense that inconsistencies like this would exist. Another point of interest is that my earlier statement that small kana did not exist in pre-modern Japanese is not actually universally true. Although it's difficult to definitively say so, it appears that the second kana in 「びっくり」 is actually the small version of 「つ」. As I've never seen in this practice in Heian-era literature, it's most likely something that gradually developed since that time, with it becoming standardized only after WW2. The final point of interest is the final verb, 「うちながめ」, which appears to be the continuative form （連用形） of the verb 「打ち眺む」. 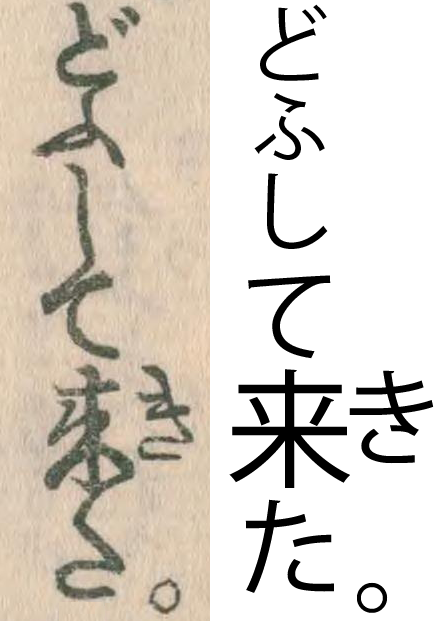 Since both the imperfective （未然形） and continuative forms end in 「め」, the fact that it's continuous was determined from the context - the next sentence (fig. 2) contains a quote by Tanjirou. As for the meaning of the verb itself, my classical Japanese dictionary defines it as 「もの思いにふけり、ぼんやりと見る」, meaning "to be lost in thought/anxiety and appear absentminded". Since the idea of being lost in thought seemed to clash with the 「びっくり顔」 ("surprised face") mentioned in the quote, I went with "anxious". I still think I might be missing something here though. There are a few things to note about the speech pattern. First of all, note the 「じやアね」 in fig. 2 - if I'm not mistaken, this is still a feature peculiar to the Tokyo dialect, which suggests that Tamenaga tried to inject some verbal authenticity into his characters' speech styles. Second, the sentence in fig. 3 is identical to modern Japanese in pronunciation. Rather than using the classical Japanese 「来」 (pronounced 「き」) for the realis (past tense) form of the verb "to come", Tamenaga has used the form we still utilize in modern Japanese - 「来た」. Once again, despite the undeniable classical influence on the narrative style, Tamenaga appears to be making the effort to prevent that from percolating into the characters themselves. "And it's also odd that you knew that I was hiding here" (fig. 4). One of the harder parts of this sentence was figuring out the kanji for 「此所」. 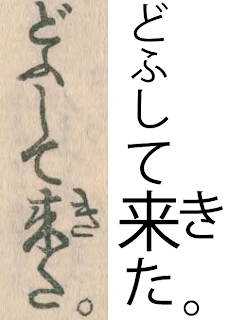 According to Tangorin, both 「此処」 and 「此所」 are valid for 「ここ」 (which made grammatical sense here), so I checked on an online kuzushiji database, and the second kanji looks like 「所」, though I'm not quite sure why, from examining the radicals. 「知れる」 is 「知る」 ("to know", just as in modern Japanese), a yodan verb in the realis form （已然形）, followed by the auxiliary verb 「り」, in the attributive form （連体形）. 「り」 has several possible meanings, but I think it has the "resultative" connotation here, meaning it refers to something that has happened and continues to be true in the present. The reason why 「り」 is in the attributive form is because it's followed by the quotative particle 「と」, which must be preceded by either a noun or the attributive form of a verb, the latter of which implies an omitted noun between that verb and 「と」. Another difficulty I faced was deciphering the last 3 kana in the sentence, because the middle one, 「こ」, does not have a distinct upper stroke. However, I knew the sentence wouldn't make grammatical sense if it ended with 「ふしぎなと」, not to mention there was an extra stroke lying unused between 「な」 and 「と」. So I turned again to Nihongo Resources, and searched for "?と". "Well, in any case, come over here. This must be a dream," Tanjirou said, rising and sitting down (fig. 5). Not too much to comment on here. Note the lack of a period after 「こちらへ」, even though it would have been grammatically appropriate. 「おきかへりて」 is 「起き返る」 ("to rise/sit up") in the continuative form （連用形）, followed by the continuative particle 「て」, and then the verb 「座る」 in the predicative form （終止形）, since it's at the end of the sentence. I believe this is the first time we're encountering the placement of two parallel lines of text describing the action of the speaker after a quote, 「おきかへりてすはる」 in this case. I've never seen this before in any sort of Japanese writing, modern or classical, so if anyone can shed some light on the practice, I'd appreciate it. Edit: from the comments, looks like this is called togaki （ト書き）, literally "stage directions" ― the term/usage originates from manuscripts for premodern Japanese plays. Another difficulty I faced was deciphering the last 3 kana in the sentence, because the middle one, 「こ」, does not have a distinct upper stroke. Yeah, it's actually an abbreviation! The name for this type of character is 合略仮名. There aren't that many of them. The hiragana yori and katakana koto made it into Unicode, but not the hiragana koto or nari. I believe this is the first time we're encountering the placement of two parallel lines of text describing the action of the speaker after a quote, 「おきかへりてすはる」 in this case. The word for this type of comment generally is "togaki" ト書き and it is basically stage directions, but it got imported into non-staged works like this along with the other conventions for indicating dialogue (name in small characters before open-quote mark, etc.) I haven't actually researched this, but what I see in my general reading is that books alternate between passages of "description", where there is no dialogue, and "dialogue", where all of the text, basically, is in dialogue form, separated by headers indicating the speakers; and any description is in the togaki, which is in turn in "warigaki" (割り書き, delete okurigana as desired) to distinguish it from the dialogue. Wow, that's very interesting. I would have thought that most theatrical productions in pre-modern times wouldn't have had written scripts, instead relying on just memory and oral transmission. I saw on your site that you've translated some Meiji-era works. Do you know when the shift from indigenous narrative patterns to the Western style began? Was that part of the Meiji-era changes, or did it only come later? I would have thought that most theatrical productions in pre-modern times wouldn't have had written scripts, instead relying on just memory and oral transmission. Yeah, written scripts as such have a surprisingly low profile today -- like, I totally expected to be able to buy plays by Zeami or Chikamatsu as easily as I could buy plays by Shakespeare in an English-speaking country, but that's really not the case, presumably because there is so much that was transmitted orally, and really has to be seen on stage to be appreciated (the singing, dancing, etc.). I suppose it's like asking "Why can't I go into a bookstore and buy a book of Verdi or Wagner librettos?" The answer is basically "Why would you want to buy just the librettos?" But, it seems that the format of the written scripts was totally adaptable to purely literary works like S.U., with no singing/dancing involved. Do you know when the shift from indigenous narrative patterns to the Western style began? Was that part of the Meiji-era changes, or did it only come later? Yeah, I'm in a similar position, since I'm just going off of 2 classical Japanese classes I took in college, and I haven't studied the history much at all (formally or informally). I thought it would be pretty easy to teach myself with online information (like I do for computer/programming-related things), but detailed information is surprisingly scarce. When you're in the tech bubble, you often don't realize that much of the world hasn't shifted to digital media. That was a motivation to do this work on a blog, so that it would be openly accessible for anyone searching for info on this online. And of course Japan had other styles even before then; the Genji Monogatari is much more "novelistic" in that its sentences are like "X, said Genji; Y, replied the Empress" rather than like a script. I decided to look into this a little, and I noticed that there were definitely works even from the Taisho period (such as by Akutagawa) that have "bare" quotes (without either the Western style "X said" or ト書き), just like modern pop fiction (like light novels). However, at least some translations of Western novels (I checked 七王国の玉座, the translation of A Game of Thrones) use the 「Xはいった」 format. I certainly don't like the "bare quote" practice - some English-language authors use it as well, and it can make things quite confusing when there are lengthy conversations without any intervening narration.